Kat graduated from Bangor University in 2007 with a BSc in Psychology with Clinical and Health Psychology. She continued at Bangor for an MSc Foundations of Clinical Psychology. Her Masters’ thesis was Memory Awareness in Older Adults where she looked at awareness of memory ability in healthy older adults and people with dementia. Kat joined the Dementia Services Development Centre (DSDC) Wales in 2009 and during her time talking to both carers and people living with dementia she has gained an understanding for the need for services for people with dementia, and the need to educate others about dementia to reduce the stigma. Kat is passionate about improving the quality of life and well-being for people living with dementia and those who support them. In particular she has developed a keen interest in the benefits of the arts for people living with dementia and in 2015 completed her NISCHR-funded PhD: "Can an arts programme increase the wellbeing and quality of life of people with dementia living in a care home: An exploratory study". Kat led the evaluation of Age Cymru’s cARTrefu programme and launched the report at the National Assembly for Wales in 2017. Kat was Principal Investigator on the ‘Creative Conversations’ project which developed an arts based care home staff development programme. Kat is the Bangor Coordinator for the Wales Centre for Ageing and Dementia Research (CADR) and also co-leads the Creative interventions for older age and dementia care work theme with Professor Gill Windle. 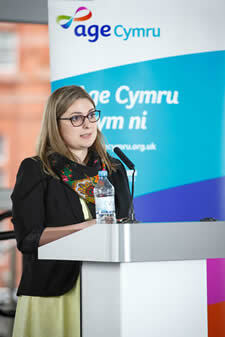 Kat is the Wales Coordinator for Join Dementia Research (JDR). Can the arts influence care staff representations and assumptions of advanced dementia? The Wellcome Trust Residency Hub. £15,236.00 April 17-July 18 (Co -I). Algar-Skaife, K. Caulfield, M., & Woods, B. (2017) cARTrefu: Creating artists in residents. A national arts in care homes participatory and mentoring programme. Evaluation report 2015-2017. DSDC Wales Report, Bangor University, School of Healthcare Sciences. Salisbury, K., Algar, K & Windle, G. (2011). Do we know enough about the potential of art programmes to improve the quality of life and well-being of people with dementia? The Journal of Dementia Care, 19(3), 33-37. Woods, B. & Algar, K. (2009) Evaluation of Flintshire Admiral Nurse Service. DSDC report, Bangor. Algar-Skaife, K. (2018) ‘Welsh Magic’: The arts in dementia care in Wales. Invited Presentation: Health and Wellbeing Lecture Series IX: Dementia. Pontio, Bangor University, 4th December 2018. Algar-Skaife, K., Caulfield, M., Woods, B. (2018) cARTrefu: Creating artists in residents. A national arts in care homes participatory and mentoring programme. Part of a symposium: ‘Welsh Magic’: The arts in dementia care in Wales at the13th UK Dementia Congress, Brighton, 6th-8th November 2018. Algar-Skaife, K. & Killick, J. (2018) Creative Conversations: an arts based approach to care staff development. Part of a symposium: ‘Welsh Magic’: The arts in dementia care in Wales at the13th UK Dementia Congress, Brighton, 6th-8th November 2018. Killick, J. & Algar-Skaife, K. (2018) Creative Conversations – a new attitude change approach for care staff. Workshop at the13th UK Dementia Congress, Brighton, 6th-8th November 2018. Peach, C. & Algar-Skaife, K. (2018) A care home manager’s experience of taking part in the ‘Creative Conversations’ research project. Invited presentation at ENRICH Cymru North Wales Launch, Llandudno Junction, 13th September 2018. Caulfield, M. & Algar-Skaife, K. (2017) cARTrefu: Creating artists in residents. CADR Conference 2017, Cardiff, 10th October 2017. Algar-Skaife, K. (2017) cARTrefu: Creating artists in residents. Evaluation Report 2015-2017. Invited presentation for launch of cARTrefu evaluation. Senedd, National Assembly for Wales, 10th October 2017. Algar-Skaife, K., Woods, R., Robinson, E., Noyes, R. (2017) cARTrefu: creating artists in residents. British Society of Gerontology Conference 2017, Swansea, United Kingdom, 5th July 2017. Algar, K., Woods, R., Robinson, E. & Noyes, R. (2016) cARTrefu: creating artists in residents. Preliminary Results from Year 1. 26th Alzheimer Europe Conference: “Excellence in dementia research and care”, Copenhagen, 31st October 2016. Algar, K, Woods, R., Windle, G. (2016) “I thought you’d be wasting your time, if I’m honest”: A qualitative exploration of the impact of a visual art programme for care home residents with dementia. Poster Presentation. 26th Alzheimer Europe Conference: “Excellence in dementia research and care”, Copenhagen, 31st October 2016. Jones, C., Algar, K., Woods, R., Roberts, C. & Goodrick, J. (2016) INTERDEM masterclass: Involving people with dementia as advisors to your research. 26th Alzheimer Europe Conference: “Excellence in dementia research and care”, Copenhagen, 1st November 2016. Algar, K. & Mutka, E-M (2016) cARTrefu – arts in care settings. Centre for Ageing and Dementia Research (CADR) Annual Conference, 5th October 2016. Algar, K. (2015) Can a visual arts programme increase quality of life and well-being in care home residents with dementia? An exploratory study. Living well with dementia through the arts: Celebrating creativity for people living with dementia in North Wales, Bangor, 21st April 2015. Algar, K. (2015) “I thought you’d be wasting your time, if I’m honest”: A qualitative exploration of the impact of a visual arts programme for care home residents with dementia. Part of a symposium: Newman, A., Jones, C.H., Algar, K., Howson, T. ‘Challenges of the research process: reflections on the progression of research in visual art groups for people living with dementia and those who care for them’. British Society of Gerontology, Newcastle, 2 July 2015. Algar, K., Howson, T. ‘Inter-disciplinary methodologies for understanding the impact of creative activities’. British Society of Gerontology, University of Southampton, 3 September 2014. Algar, K. (2013) The creative arts and dementia care. January 2013, Dementia with Dignity Conference, Wrexham Social Services, 21 January 2013. Algar, K. (2012) Evaluating an arts programme in a care home. Part of a Symposium: Windle, G., Bird, M., Pavlicevic, M. & Wood, S. ‘Art and Dementia: Improving the evidence base’ November 2012, 7th UK Dementia Congress, Brighton.